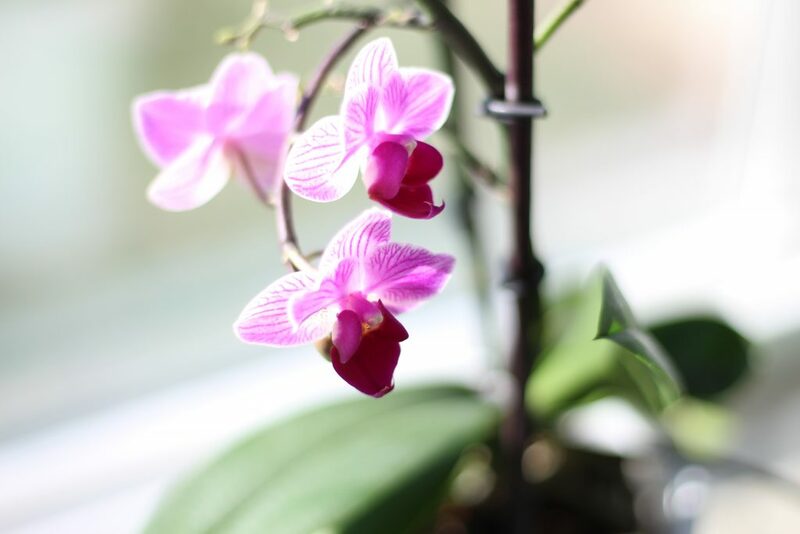 Throughout my life I have owned several orchid plants. They are beautiful, low maintenance, and the variety of sizes makes them very versatile. 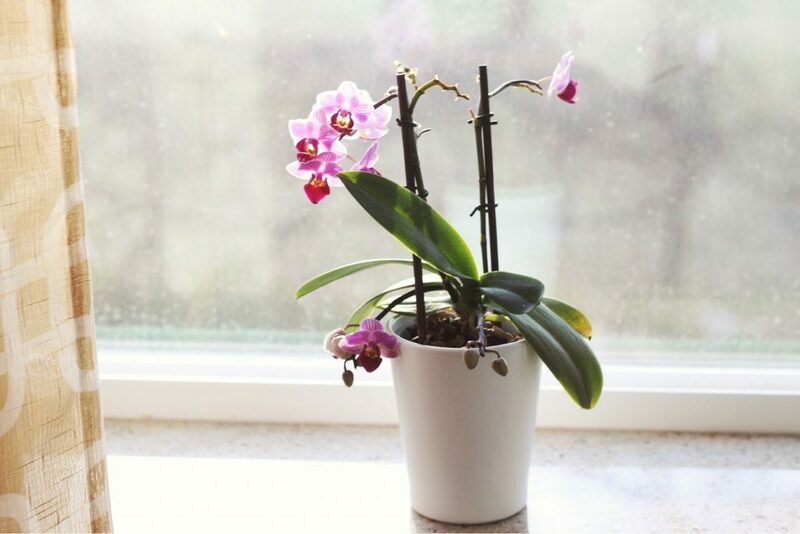 They make wonderful gifts, and I have been the recipient of a number of heartfelt orchid gifting’s. There is one problem I have with Orchid’s though. I can never get them to re-bloom once all the flowers have expired, no matter what I do. I have tried many times in many ways, only to end up throwing the plant out after a year of no blooms. But one very special Orchid changed all of that. The most intense hours of my 42 hour labor with Indy were spent with Jordan, my labor and delivery nurse. Jordan was one of those nurses that you never forget. She was kind and soft-spoken, but confident and strong. 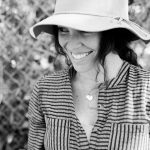 She reassured me while I cried as I gave up my desire to have a natural child-birth, then held my hands and talked me through the anxiety and pain as I got an epidural. She supported me through 12 grueling hours of labor. I felt a connection to her from the beginning and I feel an even stronger connection to her now, more than one year after Indy’s birth, all because of one tiny Orchid. Jordan was not present when Indy was born. Her shift ended a few hours prior. However I wish she could have been there… I feel that having her present would have brought me some comfort that I was so desperate for in that moment after her birth. But after the longest and loneliest 24 hours of my life, and my first 12 hours of sitting bedside in the NICU, I saw Jordan. She walked through the doors of L&D, saw me, and immediately grabbed me. She hugged me long and tight and told me everything was going to be okay. We both cried as she told me, “You’ve got this. Everything is going to be okay. If anyone can do this it is you two, stay strong”. There was no “I’m so sorry” or sad, sympathetic words like we had heard from so many on the medical team. Only reassurance, confidence, strength and faith. She saved me in that moment. She gave me the strength to keep walking when I was on the verge collapsing. That one hug- those reassuring words- they buoyed me up in the way I needed right at that time. I am certain that Jordan is unaware of the impact that simple act had on me. The following day Jordan came to visit us in my post-partum room. She walked in carrying a beautiful, Japanese orchid. She told me that when she got married her grandmother gave her some words of wisdom, to “Bloom where you are planted”, and grow in love. This orchid was a representation of the wish she was passing on to us, to bloom where we had been planted. It was perfect wisdom, and a phrase I will cherish forever. Our Doula’s were present when Jordan delivered the orchid. 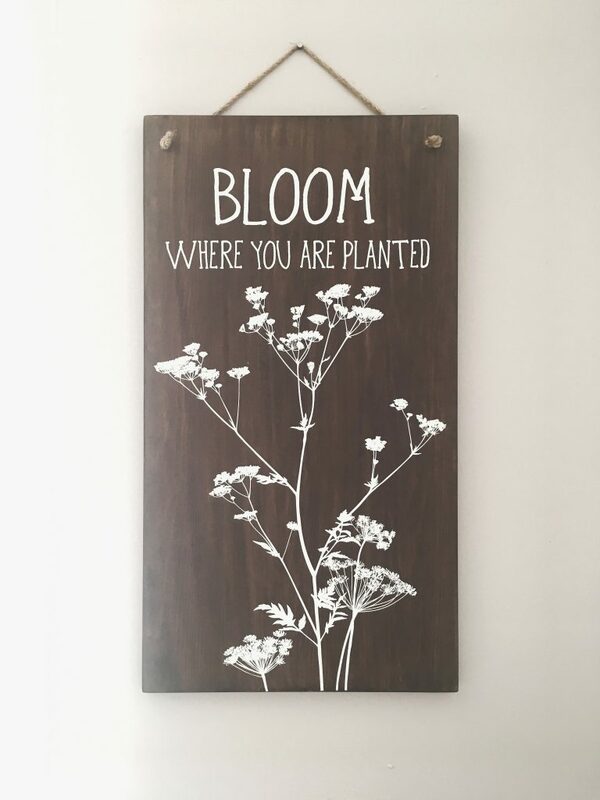 The were touched by her sentiment, and bought us a beautiful wall piece that says “Bloom where you are planted”, that hangs in Indy’s room. It is a daily reminder to grow in love and happiness no matter where we are. The blooms expired from my orchid a few months later, as is typical. After 6 months of care and thinking this orchid would end up like the others and never bloom again, I noticed a tiny flower starting to blossom. My heart felt the biggest warmth- and tears filled my eyes. This was more than having an orchid re-bloom for the first time. This was something special. To me this was God’s way of saying, “Bloom where you are planted, and then Bloom again.” In my heart I felt the second bloom occurring. I was falling in love with my life again. I guess the magic of Orchids is that with dedication, care, and love, those beautiful blossoms can come back to life time and time again. It doesn’t come easily, but with patience it will come. Life will eventually take all of us to places we never planned or imagined. If we choose to bloom where we are planted and grow in love, our life can be that radiant flower that emerges from the earth in its season, wherever the wind has carried its seed. What beautiful wisdom for all of us. Stop being so awesome. I love watching you bloom, bloom again and then bloom some more. I’m so grateful to have a front row seat to your incredible journey. Love you so much best friend.